Carson has been taking Karate classes for several months. Hanshi Darren Cox, the owner of All Star Karate, the dojo Carson belongs to, has been his instructor. 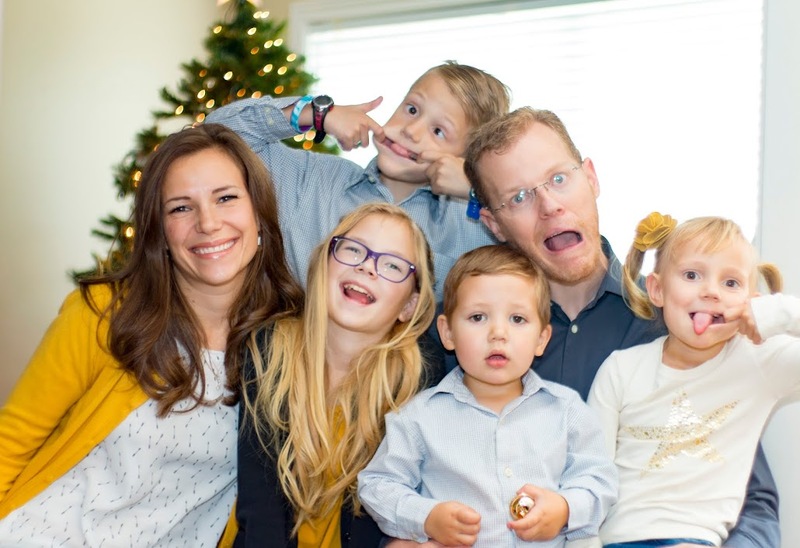 He is such a great teacher and does a very good job with the kids. It's been a lot of fun to see Carson's personality flourish while doing karate. At first, like any other new student, he was quiet and observant. His confidence though has grown a lot, and he has discovered a place where he can use his loud voice without worry. In fact, the louder he is when delivering his moves, the more he intimidates his opponent. And boy, is he loud! In order to pass from one belt to the next, he had to memorize several different combination of attack and self defense moves. As he passed each one of them off, he earned a colored stripe on his belt. 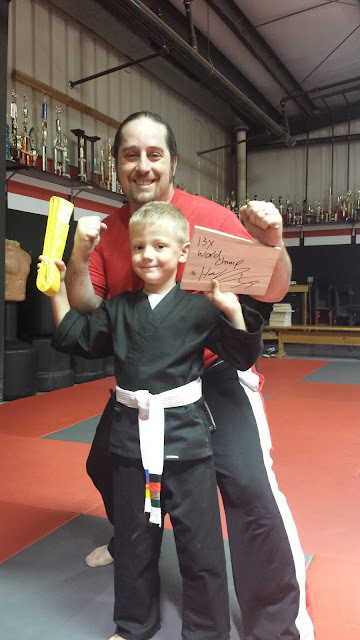 After passing off all of the stripes he was able to test for his yellow belt. Karate is more than just self defense. It is also about self discipline and respect, which are elements stressed during the lessons. 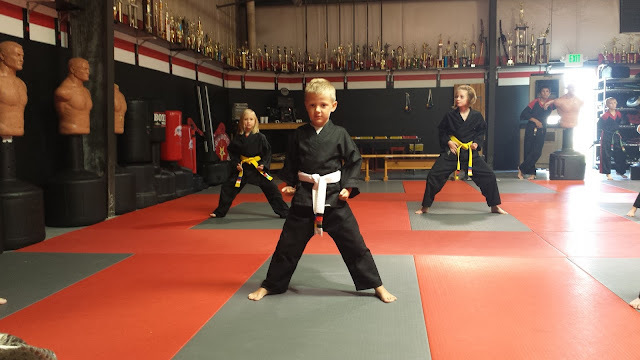 The kids have a weekly report card where a parent checks off if their child has practiced but also if they have demonstrated black belt behavior at home and school. Whenever testing for a belt advancement All Star Karate calls the kids teacher to verify they are behaving well in school. The kids can also bring their report cards to show they are not slacking in school. In exchange, each week the kids earn tickets they can exchange for toys, tshirts, or treats at the dojo gift 'shop' by the front desk. 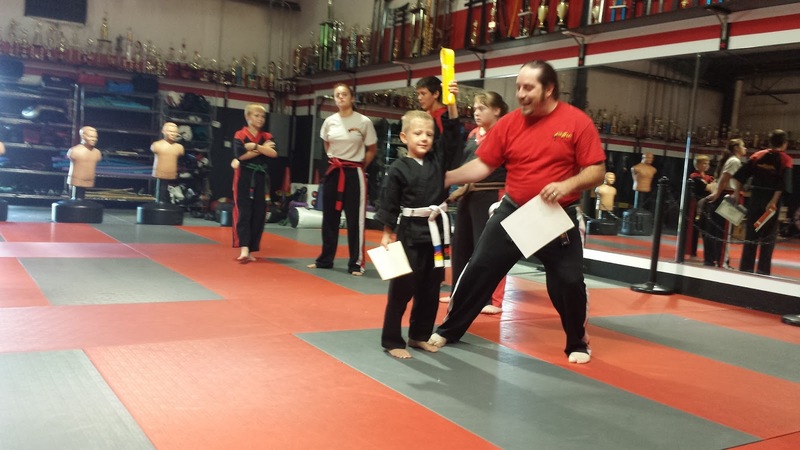 Needless to say, Carson passed his white belt exam and is now officially a yellow belt. His older sister and a neighbor friend have joined him and are also taking karate classes now. There are countless reasons why I think Karate is a great sport. It is something that allows him to be more physical, which he doesn't get to do often at home with two sisters. Karate is also a life skill he'll have the rest of his life. In Karate the higher belt teaches the lower belts. So he often called upon to go first or to demonstrate a learned principle. This hierarchy has given him confidence because age is not as important as what you know so he is often standing in front of older kids showing them how to do a move.